So, your organization may need a point-to-point fiber-optic network, also known as P2P fiber. A point-to-point fiber optic network provides a direct, dedicated connection from an access node to remote workstations, servers, or business locations. This creates a direct connection for data transmission, offering dedicated bandwidth. Is P2P fiber right for you? Well, that depends. Keep the following factors in mind when evaluating your technology options, providers, and deploying the right business network for your needs. 1. How Do I Know if I Need a Point-to-Point Fiber Network? Sometimes, organizations opt for P2P due to its governance features. The technology allows administrators to manually control bandwidth allocation per port, which creates extreme flexibility. Learn more in Connecting Your Locations with a Point-to-Point Fiber Network. Point-to-point is among the more high-cost approaches to business data connectivity. For organizations who are wondering if they need P2P fiber, there’s generally a need for enhanced control, bandwidth, security, or administrative convenience that outweighs the upcharge. 2. Is a Multi-Point Fiber Network a Better Bet? The alternative to Point-to-Point Fiber-Optic networks is a Passive Optical Network, which is point-to-multipoint. These can be referred to as multi-point fiber. With the PON approach to fiber deployment, the internet service provider uses fiber to connect their switch to the client’s building. The fiber resources are shared among tenants, or ISP clients. Here’s an example of how a PON fiber network would work: If a multi-location business were backing up data at their headquarters from a remote office in a PON fiber deployment, the backup data would be transmitted from the office on shared lines through the ISP’s switch back to the headquarters location. Fiber offers enormous business benefits over other approaches to internet connectivity, such as copper cable-based internet. If your company is new to fiber and you know you want fast, secure internet, you’re right--you may not need a P2P network. Fiber alone is beneficial. The value of P2P implementations is often more clear for connecting multiple business sites or special governance requirements. 3. Where Does P2P Fiber Fit into the Landscape? Confused? That’s okay, conversations about this topic aren’t always as simple as just P2P vs. PON. You may have heard terms like “GPON” or “dark fiber” thrown around. Dark Fiber: Fiber resources that are not lit or don't have any electronics on them, yet. This is not an alternative to P2P networks. Instead, it refers to companies who choose to lay extra fiber cable for future bandwidth needs. P2P Networks: Fiber that goes from point to point. It is good for centralizing control of the network but can cost more and require more equipment. GPON: Gigabit-capable Passive Optical Networks, a GPON network consists of OLT (Optical Line Terminals), ONU (Optical Network Unit), and a splitter. The splitter will divide the signal when needed. 4. How Much Flexibility Do I Need? First, let’s make it clear that providers make a massive difference in your experience scaling your fiber or business connectivity up and down. Before you jump to P2P or PON as the right solution for your needs since you’re sick of waiting months for installations, let it be known that some fiber companies offer fast service turn-around. However, if you’re a future-looking tech department with a very high-need for configuration, P2P offers some advantages over PON fiber networks. 5. Do You Need to Future-Proof a Multi-Location Business? Many enterprises today are facing the same challenges, regardless of industry or business lines. Mobile, global workforces. Multiple business locations. An increasingly tech-savvy user base of both employees and customers who expect the ability to communicate from multiple devices from any location, worldwide. These challenges were once in front of Montgomery College, the nation’s largest community college. With three campuses, a mobile workforce, and an aging infrastructure of on-premises solutions, Montgomery College needed to simplify governance, meet compliance requirements, and unify their communications across sites and users. For Montgomery College, a P2P fiber implementation was just part of the unified communications solution. Learn more: download the Montgomery College Case Study. 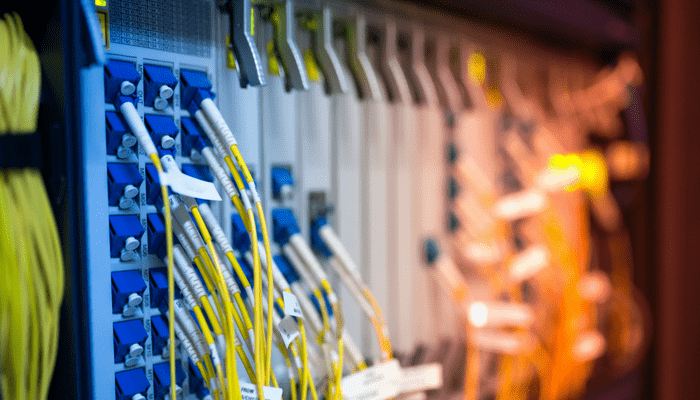 If you’re considering a point-to-point fiber network, chances are you’re already sold on the speed, bandwidth, and reliability benefits of fiber connectivity over alternatives like copper cabling, wireless or coax cable. However, understanding whether a P2P or PON deployment is the best option for your business can be more challenging. For some organizations who need to meet stringent regulatory requirements, unite multiple locations, or achieve exceptional bandwidth governance, P2P fiber can be a gamechanger. For others, simply making the switch to fiber is best. To learn your estimated costs for point-to-point fiber and alternatives, click here to get a no-obligations quote. 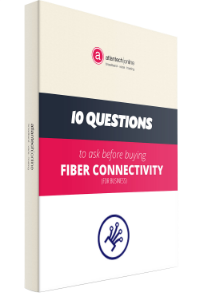 Alternatively, download our free eBook: 10 Questions to Ask Before You Buy Fiber Internet for Your Business.